The west coast, particularly CA and southern Oregon, is parched. One outside of CA only needs to spend a few minutes online or on their favorite news channel to hear about the latest wildfire consuming acres upon acres of dry brush, and causing massive emergency responses, including evacuations. Damn drought! It would take a flood of biblical proportions to get CA level again. Alas, Noah and his ark won't be making an appearance here any time soon. Here's to hoping the El Nino completely misbehaves this fall and throws a huge tantrum of rain. I shared some financial literacy on drip irrigation and saving money back in July. Today's post takes us inside of our homes, and we can all reduce water consumption, whether you need to or not, for the sake of shaving off some dollars from our H-2-O bill. Sorry for the science-e language I'm using here...must be because I'm back at school teaching 8th graders some nifty physical science. 1. Soap shower, shampoo shower. It's summer time, and the thermometer has recently reached the mid-eighties here in Coastal CA. So sweating it up is happening, even as cool as we try to stay. However, to save water and money, I'm alternating my soap and shampoo schedule. One day, I'll do a shampoo shower to take the oil out of my hair. The next day I do a soap shower, to scrub the funk off. This reduces my daily showering time by half. I'm still getting doused every day, so it's not like I'm Pig-Pen from Peanuts. 2. Jump into the shower as quickly as possible. Don't turn on the shower, take your clothes off, go use the bathroom, go wash your hands, or whatever, and then finally get it. Think about how many gallons of water per year you waste running the shower. In the summer, jump right in. Usually, the hot water comes on right away so you can turn the knob to your preferred temperature, and even if it doesn't, so what? It's hot, so pretend you're jumping into an outdoor pool. You can also use a water heater timer and have the heating unit turn on right before your set shower time in the day. Bonus: You'll save on electricity too! How much money will a water heater timer save? 3. Use a shower shut-off. Saves 20 cents per month. It's not a lot, I know, but combined with everything else, the savings add up. A shower shut-off allows you to stop water flow while you lather and turn it back on full blast when you need to rinse. 4. Don't wash you dishes twice. If you have a dishwasher, and run it daily, then why are you seemingly washing your dishes prior to loading them in the dishwasher? 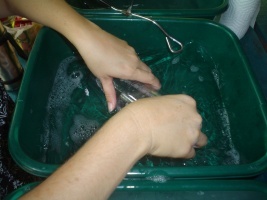 Have a small tub in your sink, fill it with water, and soak your sponge with it. Put dish soap on your sponge if you have to remove crusty food or oils off your dishes, but leave the rinsing to the water in the tub. Now load the dishes! You've used a fixed amount of water to prewash enough for the dishwasher to take care of the rest. 5. Get a low-flush toilet, or spend $20-$30 to convert the one you have to a dual-flush one: Wikipedia. A standard low-flush toilet will use around 1.6 gallons per flush versus old models that can flush as much as 3.5 gallons or more down the drain per flush. How many times are you flushing your toilet per day? That's next! 6. "If it's yellow, let it mellow. If it's brown, flush it down." This is an urban phrase you may or may not have heard before. Basically, if you're staying hydrated all day as you should be, your pee will not be bright yellow, but you'll need to pee constantly. Even if it is yellow though, you can let it sit in the bowl until you have to pee again. This has helped my family out quite a bit. I pee after my daughter before bedtime in the same bowl she left yellow. I pee after my wife does too. 7. Don't take baths! You'll fill your bath tub with way more water than you need to bathe in to start with. 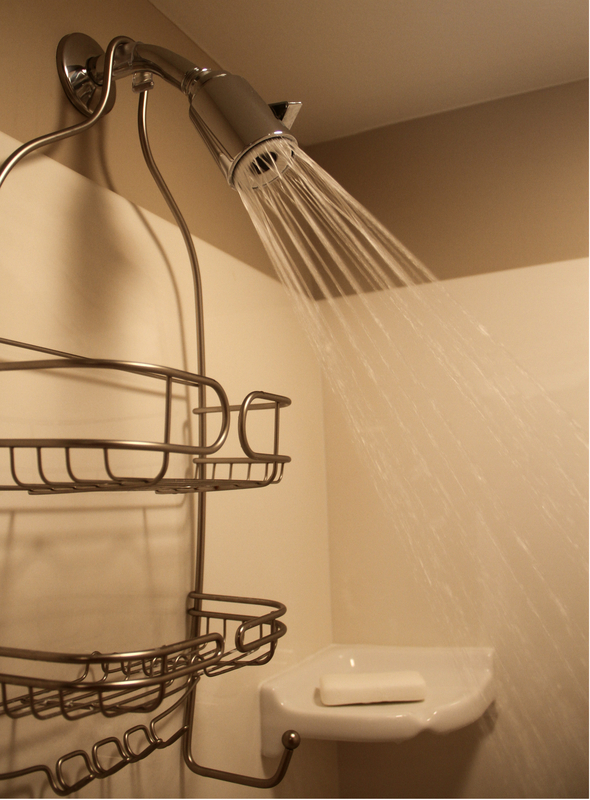 A standard shower head use around 2.5 gallons a minute. Keeping your shower time to ten minutes will still use less water than a bath. Shower like someone in the military, and you'll save even more! Here in CA we're having to seriously consider building desalination plants up and down our coastline if we're to make it out of this water crisis. A few have already sprung up. Talk to farmers from the Central Valley and you'll see how important water usage really is. But water is a resource many of us in the Western world take for granted, failing to truly understand how important it is in other parts of the world where water is scarce and people lack access to it. We should all practice some form of water conservation, and not just for the sake of our wallets! Thanks for reading! Don't forget to subscribe before you leave and get posts like this in your inbox. I think a tankless water heater is more cost effective then a tank water heater. If any one want to cut off there bill from electricity then he/she must have to use a best tankless water heater.